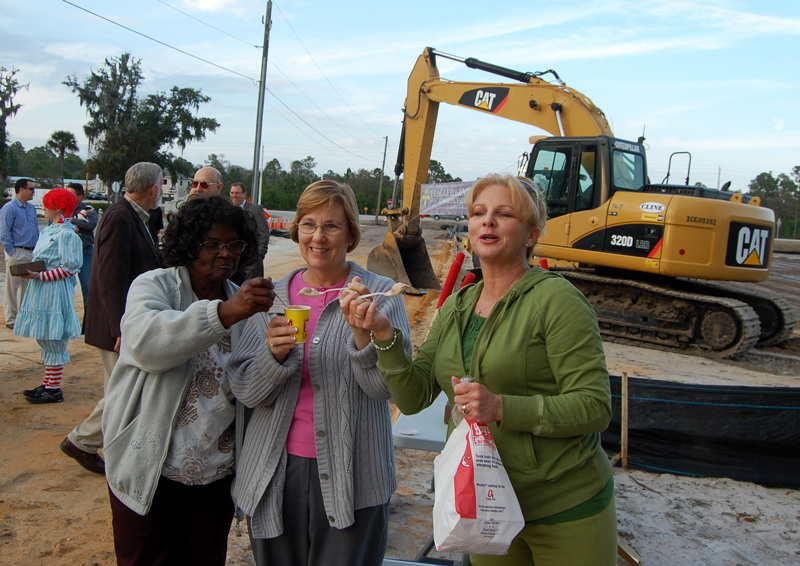 Ceremonial groundbreakings can be dull or silly. Not this one—the one that took place earlier today at the intersection of State Road 100 and Commerce Parkway, the road that dead-ends at Bunnell’s First Baptist Church. Considering how long Flagler Central Commerce Park has been in the works (almost seven years), considering the still-dour economy all around, considering Bunnell’s labors to try to get something—anything—going in town, and considering what the very first business is going to be at the new park (Wendy’s), Thursday’s groundbreaking had the feel of a triple-decker triumph. Flagler Central Commerce Park is planned as a 1 million square foot development of commercial, industrial and some residential properties. The development would progress in three phases, from north to south along the eventually stretching Commerce Parkway. Oare Associates is the land developer. It’s preparing the pads. It’s an ambitious project that, for now, has no other taker than Wendy’s, and that may not progress very far for years. It’s not lost on anyone that the development is going in a brief jog away from Palm Coast’s Town Center, the 1,500-acre development crying for tenants of its own. But as Devnet Services’ Art Barr, who is Oare Associates’ Development manager, put it, established developers with “deep pockets” can weather economic slowdowns and other challenges. “Fortunately the developer, Oare Associates, is very substantial, and obviously this wasn’t their business plan to have it take this long, but they have the staying power to do whatever it takes to ride this out. And we’re prepared to do a joint venture, we’re prepared to build to suit, so we have a tremendous amount of flexibility.” Including, Barr said, that 50,000-square-foot building county economic development officials have been harping about as a necessity for the county, if it’s to attract new industry. Of course, there’d have to be a tenant for the building. Click on the map for a larger view of the development's location and phases. Thursday, the only tenant ready to move in was Wendy’s, whose restaurant at that location would open in mid-April, according to Chris Zwirn, although the building permit for the new restaurant has not yet been pulled. Zwirn is a district manager for the company. He oversees Wendy’s two other locations in the county. The restaurant will initially hire a total of 45 to 50 employees, Zwirn said. That’s total number of employees, part-timers included. “Of course you’ve got some turn-over built into that, and that just happens with the restaurant business,” Zwirn said. A year down the line, “you can probably look at between 30 and 35” employees, Zwirn said, with wages starting at minimum wage and going to $8.50 to $9 an hour, depending on experience. The company’s benefit package doesn’t kick in until after the employee has been there for at least a year. Despite the economic challenges, the company is going ahead with a new store. “Our trends over the last two years have been really good. We’ve not really experienced any sales loss,” Zwirn said. Stores opened a year or more saw sales increase 3.1 percent in the fourth quarter, compared to the same time the previous year. That’s company-wide. Wendy’s doesn’t release individual store figures. Wendy’s/Arby’s Group Inc. has 10,200 stores in the United States, making it the third biggest restaurant chain in the country. Some 6,500 of those are Wendy’s stores. At the same time that the groundbreaking was taking place in Bunnell, Wendy’s/Arby’s Group announced that it would explore a sale of the Arby’s branch, which it acquired for $2.56 billion in 2008. The company’s stock has fallen 24 percent since that deal even though Standard & Poor’s Supercomposite Restaurants Index rose 47 percent over the same time span. Wendy’s wants to concentrate on its own brand restaurants. There are no solid prospects for now. “Anybody that comes through Enterprise Flagler is exposed to us,” Barr said. 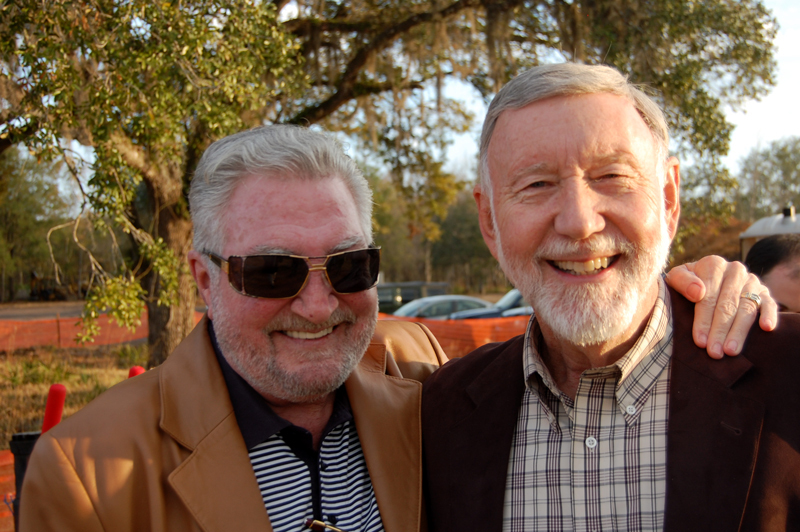 Enterprise Flagler is the county’s public-private economic development partnership. What sort of prospects have there been of late? “There’s activity. It’s hard to measure the quality of it,” Barr said. “We feel it’s a pretty level playing field that we can compete with any jurisdiction. But in any development situation these days it’s just so expensive to develop that you really need to be working with our government partners in one way or another, whether it’s a CDBG grant for infrastructure or a USDA grant.” (CDBG is the acronym for Community Development Block Grants, administered through the federal Department of Housing and Urban Development.) “In all honesty we had contracts and then the economy went south,” Barr said. One long-term prospect that would play into partnership possibilities with government: if and when the development makes it to its southernmost phase, Barr and Quello are talking with the federal government about turning the 300-unit residential development in that section, near U.S. 1, into a veterans center—homes for veterans, disabled veterans homeless veterans. People who attended the ground-breaking had several surprises. Jenny Crain-Brady, Bunnell’s vice mayor, brought Wendy’s Frosties for everyone (small ones: a store elsewhere had donated them). Barr had lined several bricks on a table for guests to take away. 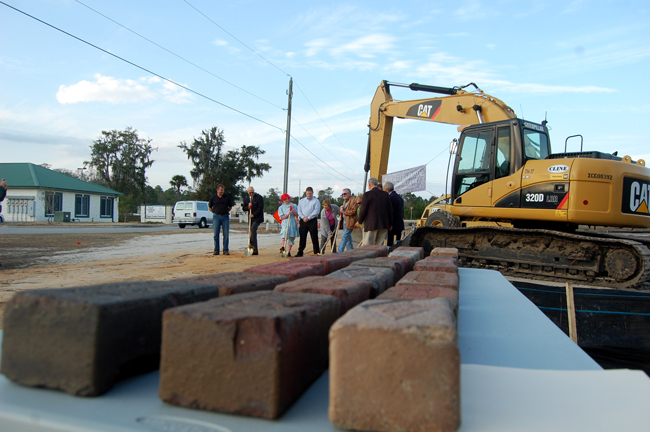 The bricks were authentic parts of Flagler County’s Old Brick Road, which ran through the Commerce Park property. They’d been excavated when workers were digging to install utilities. 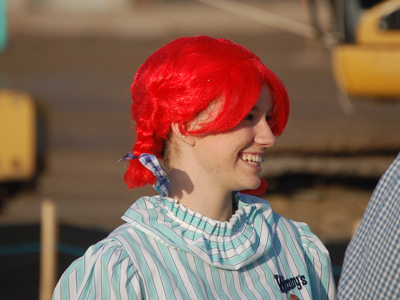 Then there was Wendy herself in her scarlet pigtails and striped knee-socks, the restaurant chain’s signature… mascot? Doll? Cartoon character? None of those: make that Ashley Brown, who works at the Wendy’s location on Old King’s Road, and volunteered for the gig. Brown, of course, was a hit, and with those Frosties appeared to make up for the missing burgers and fries. There is no doubt, that this is just a start for the City of Bunnell, with the vast amount of land available for development ( they are according to some, the second largest land area city in Florida), . They are on the record, as being new business friendly and willing to go the extra effort to make the introduction to breaking ground moment, a reality. Bunnell, may be the answer to Flagler County’s problem with new business growth..
Maybe they will be willing to open the businesses that Palm Coast doesn’t approve of. @Sendglow: Walking distance of the Southside? Nobody is going to walk a mile for a frosty. I imagine you already KNOW that already. What happened? You just HAD to get a racist dig in? @stuck in Palm Coast: But that would make too much business-sense. I’ve lived in this county for over 20 years, and I’ve seen it only backpedal on adult entertainment. They used to sell mens magazines in all the Kangaroos when they were Li’l Champs, but they did away with that sometime back in the ’90s. Then there were the bikini clubs which were chased out of town despite being nowhere near churches or schools. While I agree that the potential is there, we are still a couple of decades behind places like Daytona where the free market and the religious community coexist peacefully. Obesity? Wendys has a great selection of salads and other healthier menu items than the burgers and fries kind of food. Besides Bantam Chef and Jiffy Mart have the fried food market cornered. Plus the walk can burn off calories! As far as opening businesses in PC, the time savings for permitting and approvals is considerably shorter in Bunnell and if memory serves me, Bunnell has a moratorium on impact fees and land costs are considerably less. In business, both monetary and time savings can make a huge difference in business descisions. And how adult entertainment and mags got dragged into this doesn’t make sense. I can’t imagine any community pinning its hopes of job creation and Ad Valorum tax base on bikini bars and Playboys. But generally those business successes are tied to the citizens and not the government. Permitting is certainly faster in Bunnell but not hard to achieve when you don’t have any standards. Palm Coast looks much better because they ensure a higher standard of development. The city of palm coast needs to get with the program. They pretend to be a big city government with no clue on how to bring business to town. They had BMW and lost them. They had a Walmart distribution center and lost that. Putting in a restaurant once every 3 years is a joke. offering tax breaks to a small business that may or may not hire more employees is a joke. going after REAL business that might bring some REAL tax money to your town is the ansure. “watching” says Palm Coast has standards, like building a Town Center and thinking “Build it and They will come.” “They Came” and got scared away by a backwards permitting process and a city government that couldn’t find its rear end with both hands. Congrats Bunnell and keep up the good work. They actually didn’t get scared away… Town Center was permitted and constructed. Yes, the building isn’t fully occupied at the moment (in the worst economic situation in decades) but at least it is not empty and deteriorating to rubble like many structures in Bunnell. 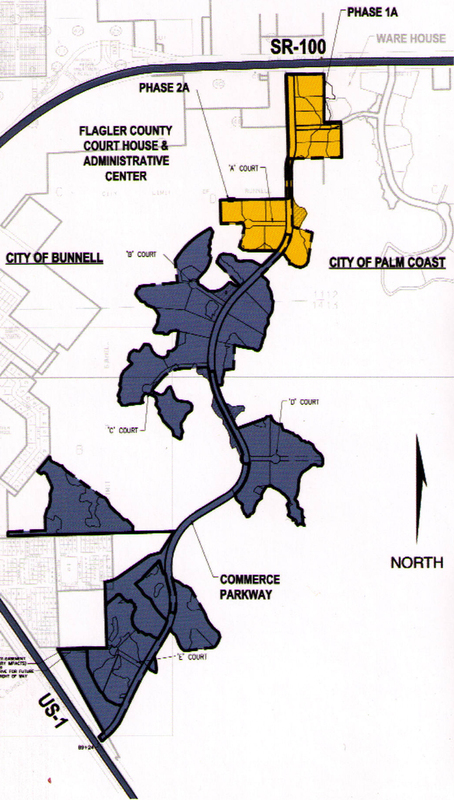 With that said, my point here is not to bash Bunnell – just to point out that comparing Bunnell to Palm Coast permitting times is like comparing apples to oranges.